I have more or less finished my giveaway journal. I hope people won’t mind but I have decided that it should go to Tracey Fletcher King. She was one of my first followers and consistently visited and left encouraging remarks. I love visiting her blog and she always lifted my spirits with her humour. With the stuff she is going to face in the next few months, I thought it would be appropriate. This is what I have already posted about. Oops forgot to finish Tracey’s name! Finally the back cover, I thought it might make Tracey chuckle. I haven’t done the lettering yet on the back, as I need to be fresh! So I will do it over the weekend. As I sort of cancelled everybody else out of the draw, I decided to have more giveaways this week. They actually are going to people who have commented regularly from my first PPF post. First last weeks winners were Ilona Heimbockel and Arnoldo L. Romero. This week’s winners are Denthe, Lynn Cohen, Linda from heARTfully inspired and Netty. During the weekend I will leave my email address in your comments so you can choose 2 postcards from my postcard page and give me your snail mail address. 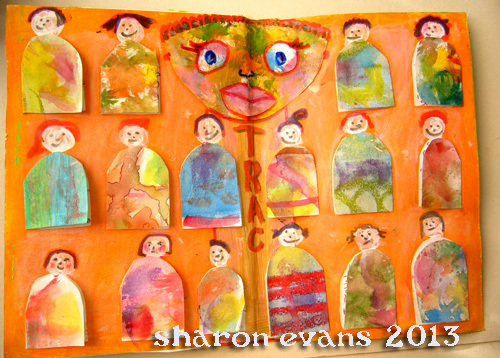 I have actually just added 10 more postcards I did this week, so visit my page and have a gander! So everybody I want to thank you again for all the lovely comments etc over my first year of blogging. 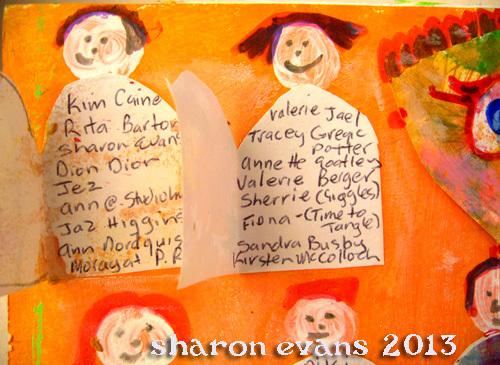 what a really lovely gestures Sharon - I know Tracey will be thrilled and such a sweet touch to include all the names of the art bloggers who've commented on her blog recently! Thank you thank you thank you for adding my name to the dresses!! And for giving the journal to Tracey...I have no doubt it will cheer her up...I am cheering up just knowing it's going there!! She so deserves it and it's so fun!! Love all your adorable pieces of art...I am thrilled when I walk by the piece I own....sitting right next to Traceys framed cards and feel that twinge of wonderfulness each time!! Oh yes she should get this. Wonderful as always.Happy PPF. Wonderful and I'm sure Tracey will love it! HPPF! Lovely journal, I'm sure Tracey will be thrilled. Happy Paint Party Friday! what a very loving and thoughtful gesture Sharon. I know Tracey will love it. That you personalized it so with well wishers postings and the cuppa back cover is moving. Oh and I see I won a bit of your art-woohooo!!! Thank you, and happy PPF! I love your idea, Sharon. It's beautiful and I know Tracey will certainly appreciate it. I had no way of reading all the names so I hope you got mine included since I always visit Tracey and leave a comment. Your work is bright and beautiful and certainly will lift her spirits. Dear dear Sharon, my heart is already heavy/full today, you know this, but this post tosses me over the top, as if I was not already there. And I do hope my name in on one of the dresses, as I have posted to her recently. If not PLEASE add my name. I love her art, I love her humor and I love her. How is it that we become so involved in each other's lives...being human I guess, and with a good heart as yours sure is. Then thank you too for my name being chosen to receive your post cards. I'm bowled over from this too. Hugs and more hugs, all the way to New Zealand!!!! What a small world we live in here in blogland. How RICH we are all for it. Lovely art journal pages. Happy PPF! I guess I missed the whole story. I'd been very busy for the last couple of weeks. 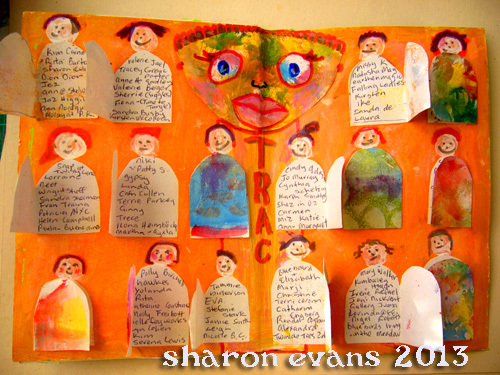 Will check on Tracy's blog and fill up all that I've missed.What you've done here Sharon is so wonderful. You are so generous to think and create something for others like this. Such a wonderful gesture. Love the dresses idea here. I'm sure she is going to love this. Will you please add my name to this? Let me now go over and visit Tracy's blog. I am so new in PPF and in Your blog, too, but Your idea is so wonderful and beautiful that I want to be with. This is so thoughtful and wonderful of you Sharon, I'm sure she'll love and appreciate it immensely! The journal looks beautiful! I hope my name's on there, I commented on her blog last week. If not please add it. 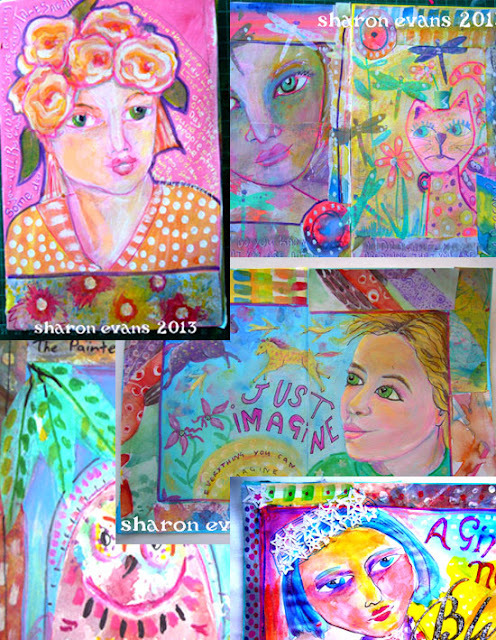 Dear Sharon, I want to thank you for the art you are sharing with us and for being "picked" to win your cards! 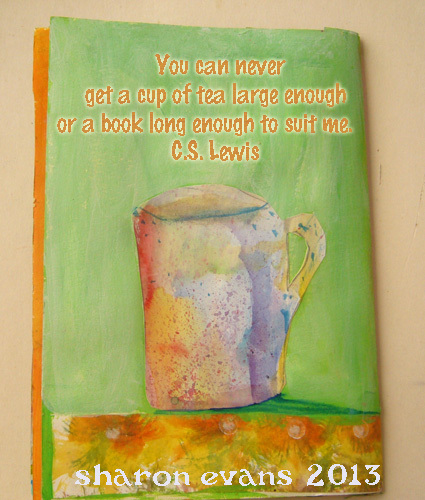 And how wonderful your journal looks and how sweet it is of you to give it to Tracey! I found my name in there too :-) Thank you! Also thank you for your comments on my blog, they are so much appreciated! A beautiful gift, from one beautiful person to another. Isn't it amazing how art finds and binds us all. 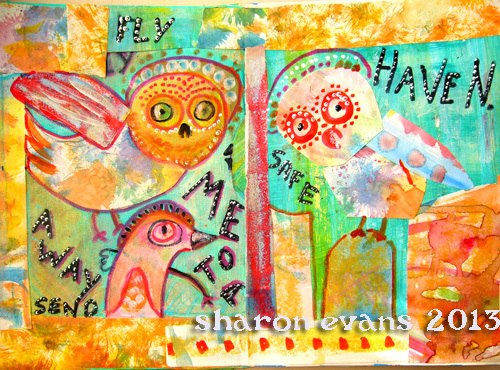 Really nice work, Sharon! It's my first time here and I look forward to seeing more in the future from PPF!